Canada across the border to the north had a great deal of steamboat commerce on its lakes and rivers and especially on the Yukon River during the Gold Rush while in the U.S. territory of Alaska the Klondike River transported gold seekers, supplies and necessities of life to frontier settlers who would not have been otherwise reliably connected to the outside world. 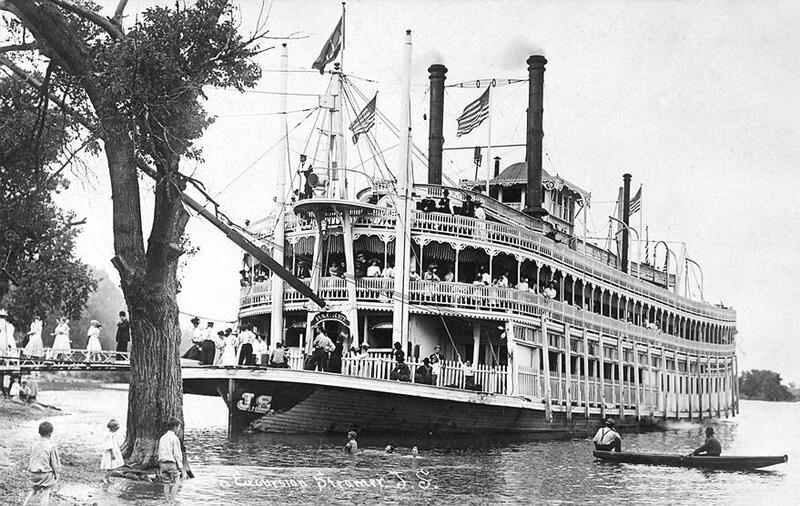 With more than 100 people aboard, the sternwheeler "Undine" was the first steamer to travel on the Columbia River from Portland, Oregon, to Lewiston, Idaho, during the week-long celebrations of the opening of The Dalles - Celilo Locks and Canal. The "Undine" was the flagship to a long string of vessels participating in the celebrations. She left Portland, Oregon at 1 a.m. on April 30th and arrived in Lewiston, Idaho on the morning of May 3rd. On the return trip she led the "fleet" from community to community to participate in canal opening celebrations. "... 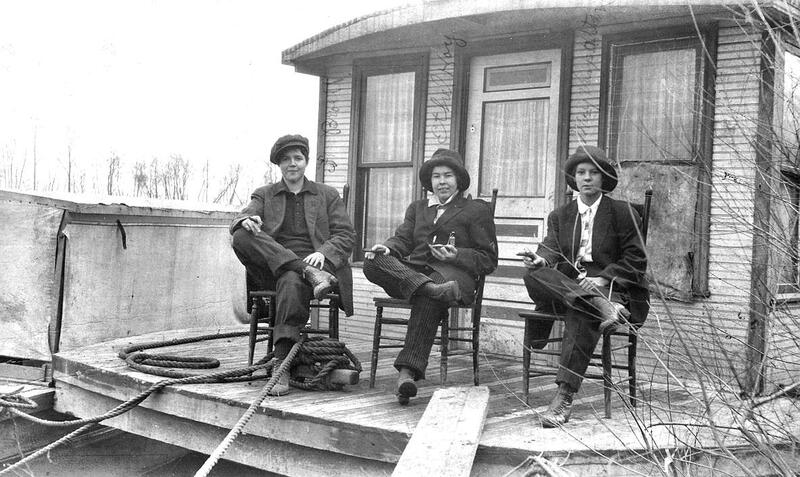 The Undine party left Portland at 1 o'clock Friday morning, April 30. The vessel passed through the Cascade locks at 6 o'clock in the morning and reached The Dalles about 10 o'clock. The vessel was delayed there for several hours on account of high winds, but about 3 o'clock in the afternoon left on the up-river journey. It took about four hours to go through the locks and waterways. The Undine's first stop was at Maryhill, Washington. The Undine reached Pasco, Wash., on Saturday night, with a brief call at Umatilla, Oregon in the afternoon. On Sunday night they stopped about three miles below Almota, Washington after calling at Riparia in the afternoon for copies of The Sunday Oregonian. After she was purchased by Captain Peel and others, she ran Keokuk-Burlington. 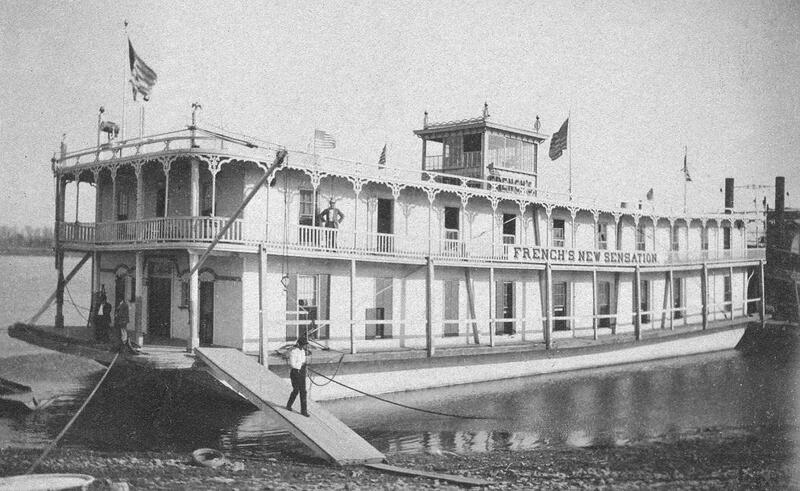 One season she sank in shallow water at Pontoosuc, Illinois and was afire once at Keokuk. Sold to Captain Walter Blair in October 1907 and after some alterations was renamed WENONA. This is a brand new real photo postcard which scanned up pretty well. John Hartford wrote an illustrated book about this incident called STEAMBOAT IN A CORNFIELD and probably a song by the same title as well. and in this photo the lookie-loos/curiosity seekers found the stranded steamer to be an irresistable tourist attraction. Imagine there were concessions selling beverages and popcorn etc. and postcards like this one must have been big sellers as well. Here is the VIRGINIA's biography from Fred Way with detail on how she became stranded in the cornfield and eventually returned to the river. Built Cincinnati, Ohio 1895 235 x 40 x 7 Compound condensing engines, 15's, 33 s- 7 ft. Four boilers, each 42" by 20 ft. six flues each.Built by Cincinnati Marine Railway Co. Machinery by Griffith & Wedge, Zanesville, Ohio. Built for the Pittsburgh & Cincinnati Packet Line,construction superintended by Capt. J. Frank Ellison. Came out new on New Year's Day 1896. She was noticed as being exceptionally quiet in operation, and we have heard Capt.William D Kimble remark that those in the office did not know whether she was in motion until they looked out the window. She had 50 staterooms in the cabin and 10 more in the texas. Her cabin was done in white with elegant panels of a material known as Lincrusta Walton. Also she was one of the first on the Upper Ohio to have a carbon arc searchlight contained in a glass fronted case with a reflector, called a White Squadron light imported from the Atlantic seaboard. Paddlewheel 23 1/2 ft. diameter working 30 ft., buckets, staggered. Had distinctive arch hogchains, an innovation later used on the QUEEN CITY KANAWHA, and others. She had good water all 1896 and is said to have paid for herself that first season. She struck a submerged bridge pier at Steubenville, Oh. on March 3, 1904, rupturing the hull, but prompt assistance from the local fire department and from towboats RAYMOND HORNER and IRONSIDES prevented her sinking. She was the first packet to pass under the completed Wabash Railroad bridge, Pittsburgh, 1904Her original fancy-topped stacks were replaced with plain 'towboat' stacks prior to April 1909 when she sank at the lower landing, Wellsville, Oh., on the 13th of that month. The towboat RIVAL was sent down from Pittsburgh to assist but arrived too late. The celebrated event of this boat's career came when she quit the river on the night of Mar 6, 1910 and was turned into a cornfield decoration. Captain Charles W Knox was master and Billy Anderson was pilot on watch. The river was in flood, and a landing was made at Willow Grove, West Virginia below Ravenswood to put off a passenger. In departing, she sidled down over Williamson's submerged field and stuck. 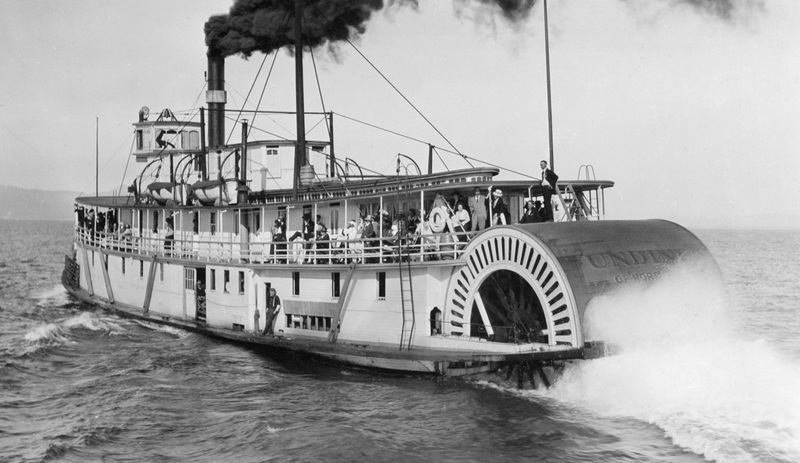 In another week she was the Ark on Arrarat, high and dry, the river a half mile away steamboat excursions were run from St. Marys, Marietta, and Gallipolis with sightseers, and the B & O Railroad ran excursions to accommodate the curious. The Pittsburgh contracting firm, John Eichleay Jr Co. was called in to move her back to the river, which was done, but she could not be launched because of the sandy riverbank soil. A fortunate rise came in the Ohio River and lifted the boat back to its bosom. The story of this epic is recounted with many photographs in the S&D Reflector issue March 1966. Another feature story on VIRGINIA appears in the same publication s March 1973 issue, copiously illustrated. 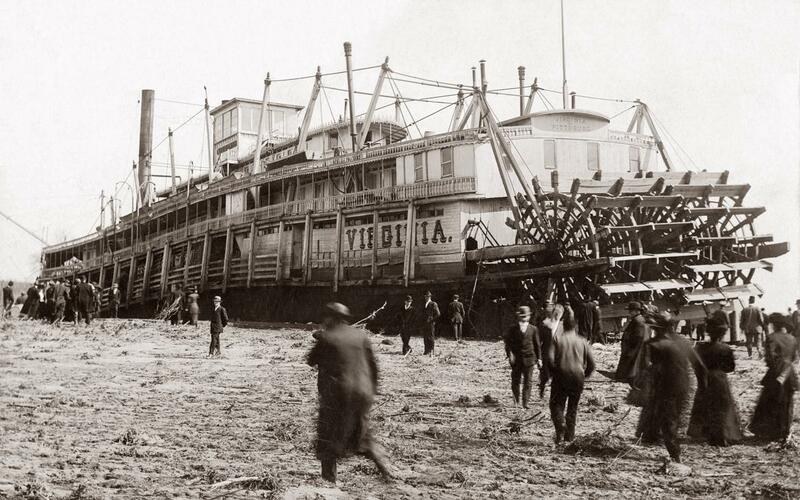 She struck an overhead cable at the construction site of Dam 26, Ohio River Dec. 18, 1911, upbound, and knocked down her stacks and tore up the pilothouse. After temporary repairs she continued to Pittsburgh and then returned to Pt. Pleasant, W Va., for repairs. At this time she was renamed STEEL CITY. J.S. 1910 real photo postcard. Lots going on at the landing. Attached scan of a real photo postcard that I plumbed and cropped for you. Self captioned by the photographer H.H. Bregstone of St. Louis. The following information I edited from a profile provided on the Howard Museum site. The ALTON was an excursion boat with a wood hull (241.1 ft. x 38 ft. x 7.3 ft.), that was built at the Howard Boatyards in Jeffersonville, Indiana in 1906. She was owned by the Eagle Packet Company in St. Louis, MO and operated on the Mississippi River between St. Louis and Alton, Illinois. She had an octagonal pilothouse and was famous for her speed, once traveling from the Eads Bridge in St. Lous to Alton, Illinois (about 33 miles) in one hour and forty-four minutes. In October 1907, ALTON carried fourteen State governors from Keokuk to Memphis in the "Roosevelt Parade" which accompanied President Teddy Roosevelt down the Mississippi. The ALTON was lost in the ice at Paducah, Kentucky on January 29, 1918. Another original cyanotype (blue "proof print") postcard from my collection (the other one was of Miss Margaret E. Johnston aboard the HENRY M. STANLEY). This showboat card was post marked 22 April, 1910. I converted both these "blue" cards to gray scale to make them easier on the eye. Cyanotype is a photographic printing process that produces a cyan-blue print. The process uses two chemicals: ammonium iron(III) citrate and potassium ferricyanide. To find more photos and information about the New Sensation, visit the Showboat photo page - click here.